chainmaille leggings / chausses are a kind of form-fitted stockings of steel rings. Our craftsmen use the most authentic medieval 4 in 1 pattern of maille. We Manufacture and Export a wide range of Suit of Armor, which is crafted by expert artisans after conducting detailed historical research. 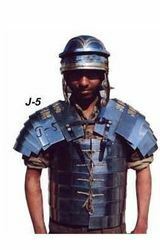 We have become a much sought after name among the Armor Exporters due to the matchless quality of our Suit of Armor. Rana Overseas leading Manufacturer, Exporter and Supplier of Metal Muscle Armour. We have wide Range of Metal Muscle Armour. We have various Size and various Designs. We are offering muscles body armor. This muscles armor is made from solid copper 18 ga. polished shine copper, thus it is very strong. It is full a coverage battle field with a reinforced area around the body . The one piece solid construction was simple yet afforded good protections. - Made from : Iron Jacket with adjustable buckles, (you can adjust size as per your fitting) Comes with front and back portions can it be used for reenactments yes All work is hand made Armor Costume Armor Jacket. We are offering high-end quality of chainmail coif to our clients. Our range of Chainmail Coif is widely appreciated by our clients which are situated all round the nation. These are widely available in various metals and finishes. These are also available at most affordable prices. We are dedicatedly involved in providing an excellent quality array of Leather Muscle Body Armor, for catering the various needs of our clients.